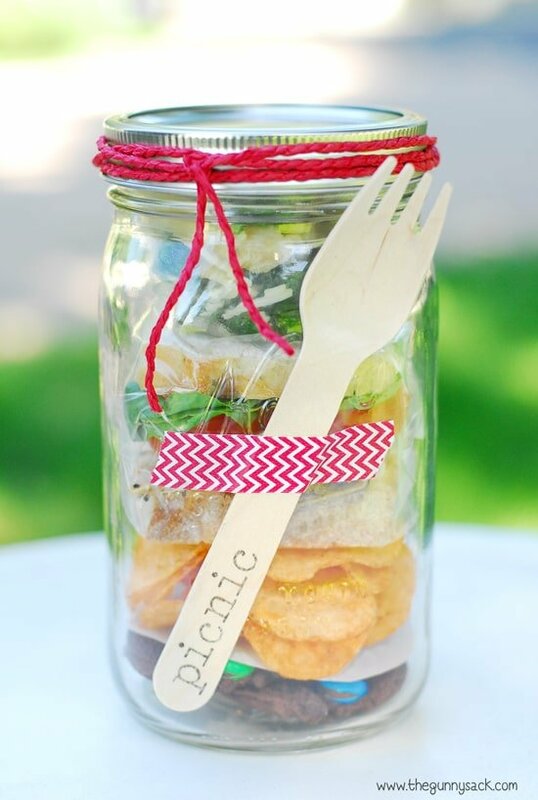 A Picnic In A Jar is one of the mason jar crafts that’s perfect for parties. 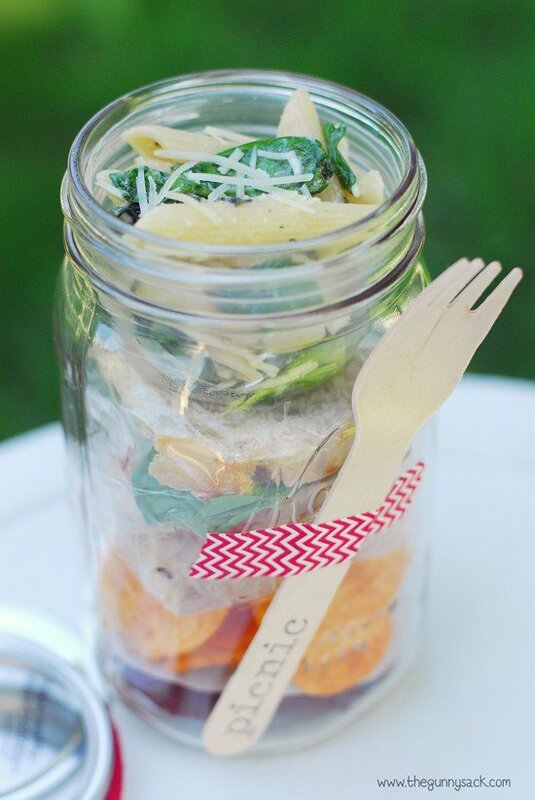 Customize the food in a jar, colors and the washi tape for the party or shower! Eating outside in the summer is so much fun (as long as the bugs leave you alone). Every morning, I grab a cup of coffee and drink it while sitting on my Adirondack chair on my front porch. It doesn’t matter if it is hot and humid or cold and rainy. Once winter comes, I am really going to miss it. Last week, I made a fun picnic in a jar that is basically like a mason jar lunchbox. I put my whole meal in one mason jar. It is easy to transport and fun to eat. 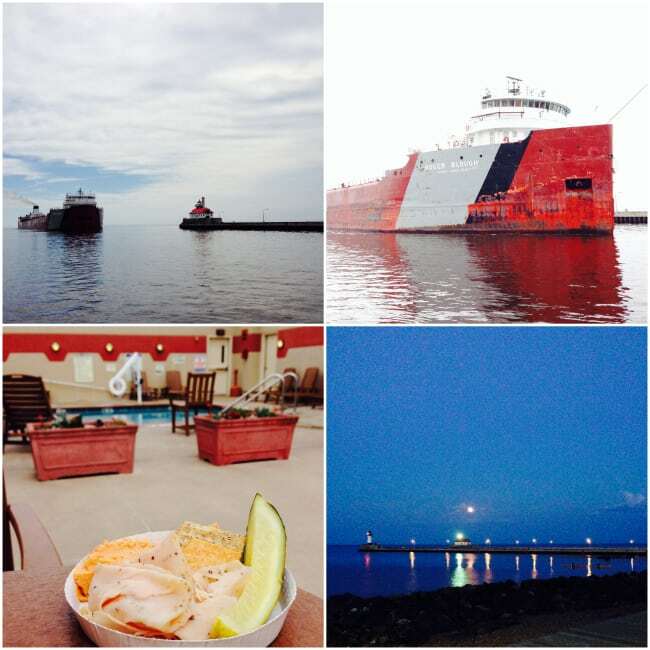 This past weekend I went to Duluth with a couple of my friends for our annual girlfriends getaway. While I didn’t have any of these picnics in a jar with us, they would’ve been perfect. We spent a lot of our time outside and we ate outdoors a lot. We always stay on Canal Park, so that we can walk everywhere from our hotel. There are restaurants, shops and of course, Lake Superior. We enjoyed breakfast on the patio, lunch by the rooftop pool, dinner on the patio at a restaurant and coffee on the boardwalk at night while watching the supermoon. My friend’s daughter has told her that every time she calls her mom while we are on one of the girlfriends weekends, “You are either walking, shopping or eating!” That pretty much sums up our trip…along with lots laughing, talking and relaxing. 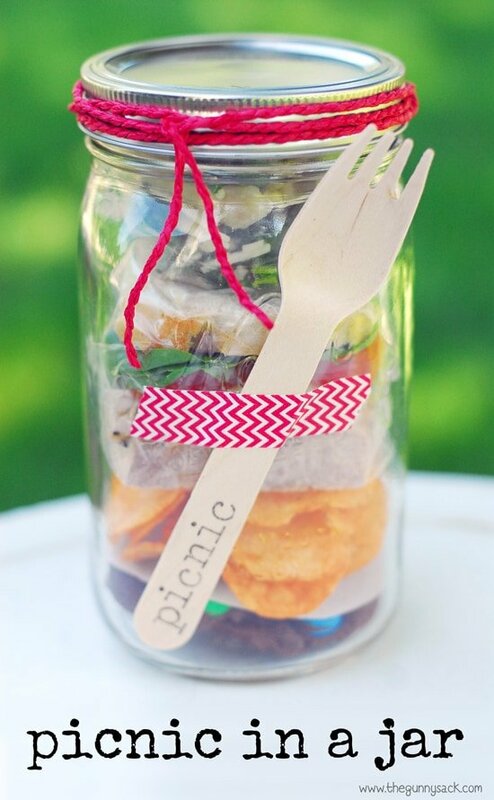 To make a picnic in a jar. 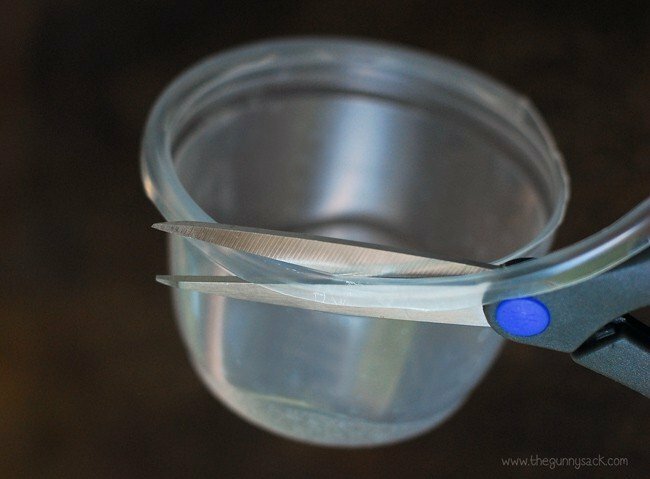 Cut the rim off of a small plastic container. I used a Glad Mini Round container that holds 1/2 cup (4 oz). Put a cookie or two in the bottom of the jar and cover them with a circle of parchment paper. Add chips to the top of the parchment paper. Assemble a sandwich making sure that it will fit into the mouth of the jar. I used rustic French bread, black pepper turkey, cheese, lettuce and tomato slices to make my sandwich. Cover the sandwich with plastic wrap and set it on top of the chips. Fill the small plastic container with salad or fruit. I filled mine with this Spinach Pesto Salad. 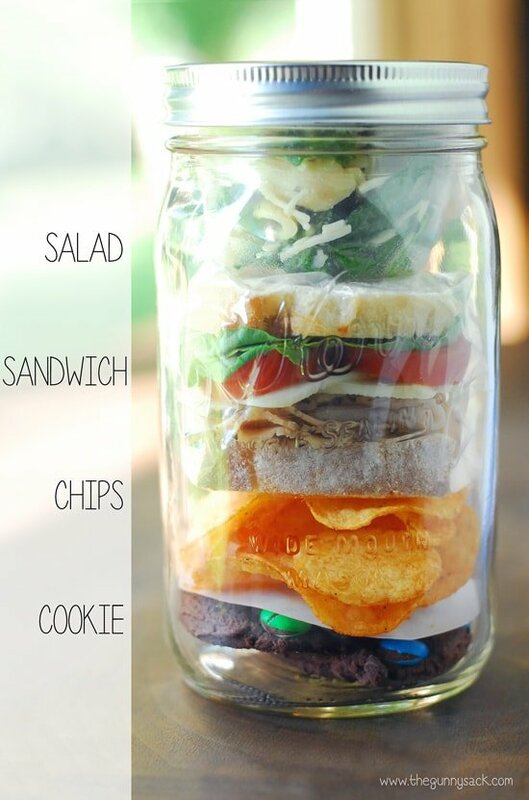 Set the container of salad on top of the sandwich and put the lid on the jar. Wrap a piece of twine around the top of the jar. I found the red twine at Michaels. Stamp a disposable wooden fork with the word picnic. My letter stamps are from the dollar section at Target and so is the piece of washi tape that I used to hold the fork in place. 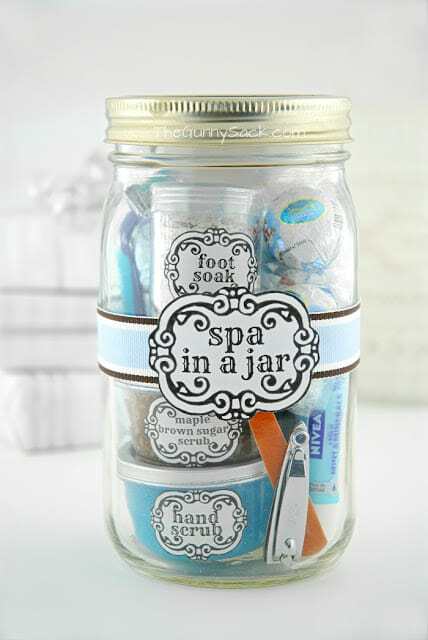 This picnic in jar would be perfect for a party or shower! They could be assembled before the party and the fork could be stamped with whatever works for the party. 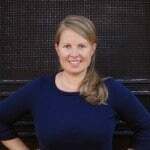 Use twine and washi tape to match the party colors. I’m excited to try the picnic in a jar for a party! Instead of using the plastic cup to hold the salad, Maybe a cupcake wrapper/aluminum wrapper could hold it. 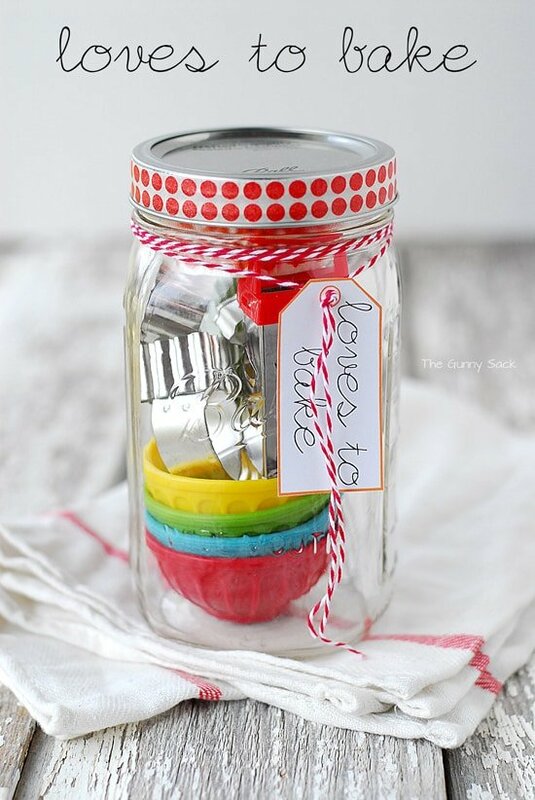 The other jar ideas are great too! Great idea! They would look pretty too! Hello…where do you buy the disposable wooden spoons and forks? 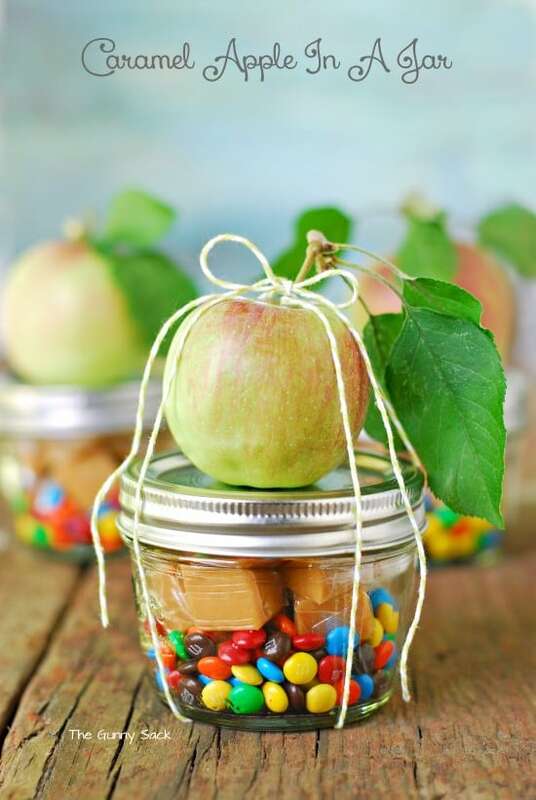 I think this is the cutest mason jar idea I have ever seen! I think I have to have a picnic this weekend just to try this out! Thanks, Lisa! I hope you have fun with it! Brilliant idea. This would be fabulous for any theme party. I think I’ll use it as a drop in gift for the elderly I visit. That would be fun! Thanks, Stacy!